Huh! You talk about free software open source databases. You claim to be 'the person' who knows everyting there is to know about DBs and then there is no mention whatsoever of PostgreSQL? What a joke of an article. Or is it that you guys can only measure it when there are sales figures? 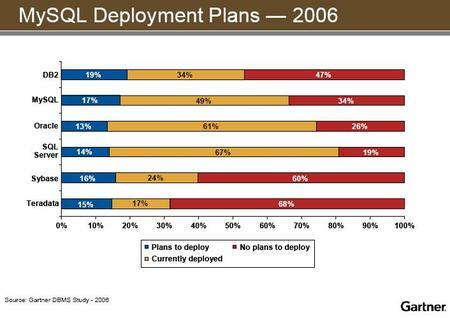 If MySQL is successful now, just wait until people discover postgresql. For one thing, in the soon to be released version 8.2 Postgresql will offer one of the fastest full text search systems available, open source or not. Myself, I'm a PostgreSQL fan so I too am disappointed that it is not mentioned. MySQL is a great product as well. At least this article does, to some degree, show that open-source products are viable alternatives to commercial products. Open-source is all about choice, so I wish both of these projects well. I can't understand how MySQL can get all this attention. It doesn't even support basic set operations such as 'except'. Try doing a relational division without that. To make things worse MySQL performs really badly in more complex queries. If I was to select an open source database product, I'd go for Postgresql. Lets hope that more people discover it now that it is bundled with Sun Solaris. Guys, ah, thanks for your comments. I'm just reporting what Gartner talked about at their conference. And I don't pretend to be objective. But thanks for your interest. I am not sure, but i bet one of the things why PostgreSQL is not so popular is that not many hosting companies are supporting it. While you can find MySQL on almost every hosting plan. Maybe it is just easier for the hosting companies to support MySQL than Postgre.. or maybe users tend to require MySQL than PostgreSQL. My guess, why postgresql is less comman in web hosting, is most likely that more people are asking for MySQL, Postgresq is not harder to run in a multicustomer environment than MySQL. 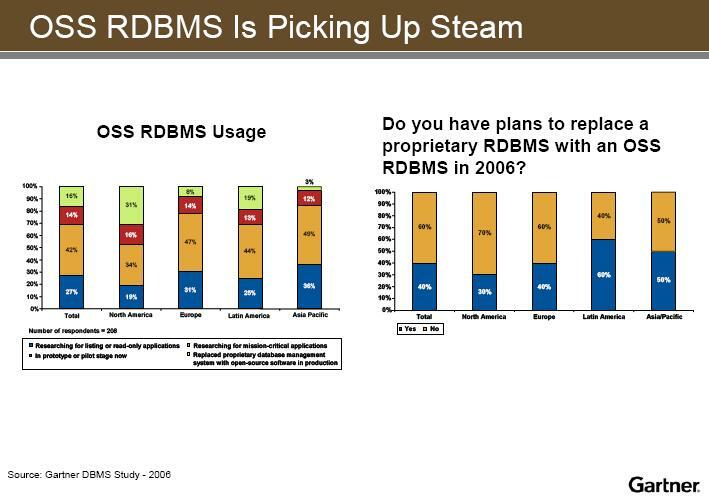 The reason for this demand that is that people have no idea what a real relational database could do for them. So they do a lot of programming themselves instead of letting the database do the job. Another reason could be that postgresql up until reasently was not available for windows, so many people had no chance of trying it out at home before ordering services from a web hosting company. 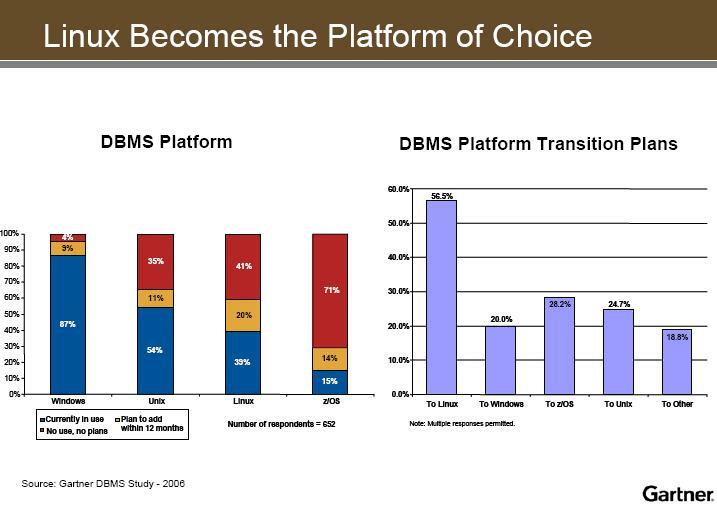 Yet another reason could be the MySQL dishonest beat and switch marketing strategy. MySQL AB tell you MySQL is the fastest database ever, but forget to tell you that this is true only if you turn off most of the functionality you expect from a relational database (e.g. referential integrety checking), and only run simple queries like "select * from table". If you have a couple of "group by" or "having" clauses MySQL will be very slow regardless how many features you turn off. If you only have a look at the feature set mySQL may loose. But, what's really important to the users is the application landscape. If the most apps deliver build-in support for mySQL, why should users ask for something else, if the app is doing the job right? If I need more power, I would ask for Oracle support ;-).